My husband remarked today to me that he could hardly believe we were at the end of March. It seems March flew by as we enjoyed many gorgeous days of sunshine here, with some highs up into the 60s, and we began to see much of our snow begin to melt. Amazingly though, we still have a lot of snow left on the ground, but it is still melting slowly. They say if March comes in like a lamb, it will leave like a lion or vice versa... if it comes in like a lion, it will leave like a lamb. 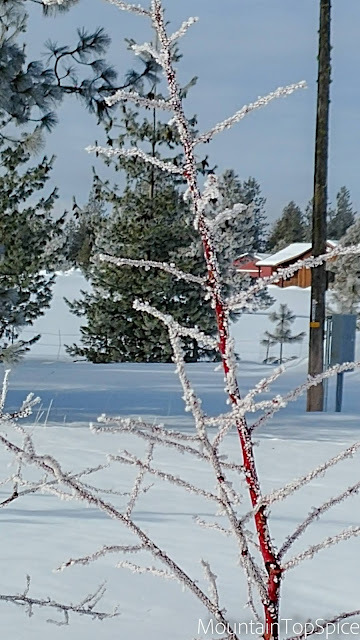 Our first day of March looked like this on our morning walk.... a nippy 8 degrees, frosty and cold! 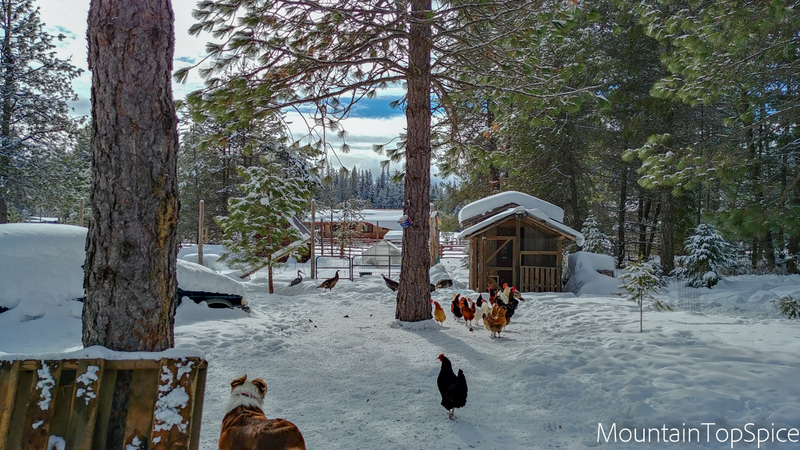 However, on the first day of March, the chickens decided to make a run for it, out of the coop. I didn't blame them a bit. It had been a long winter! 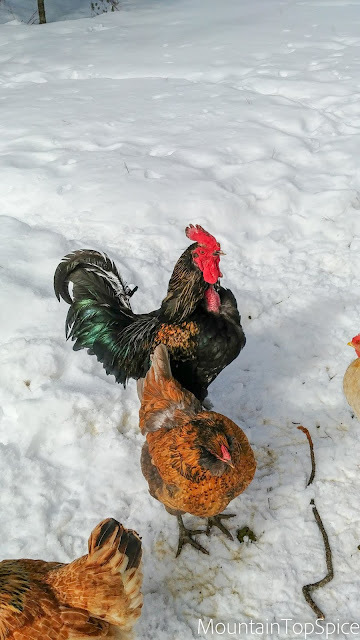 Poor old Mr. Pepper our oldest rooster, he has made it through the winter! On this very cold day, the turkeys huddled like this to keep warm. 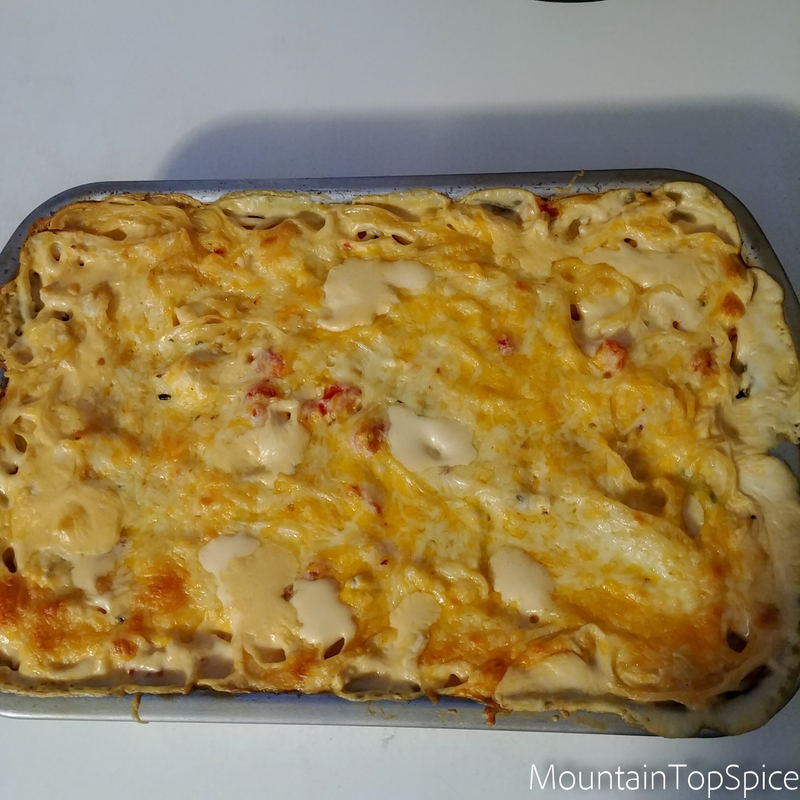 One of our very favorite meals is this Chicken Spaghetti, which I often make on cold winter days. 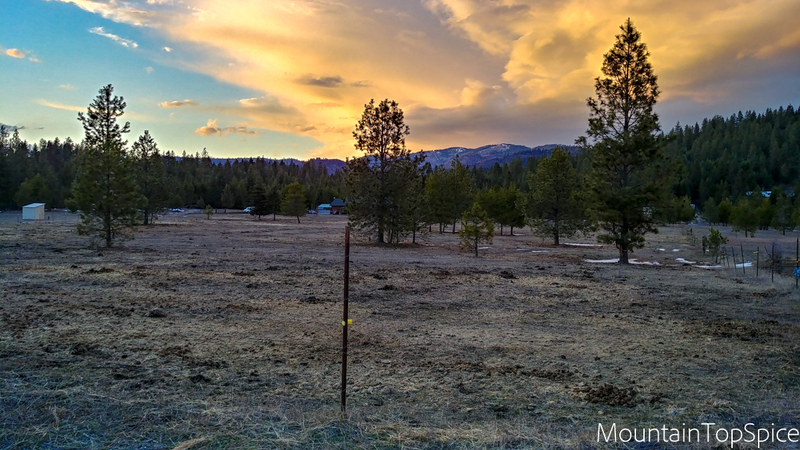 Always wonderful to see the clouds rolling in billows of color on the horizon. Icy roads in March gently bathed up by the day's last light. Hoar frost coating the wild rose that blooms in my neighbor's yard. Soon... it will be sporting blooms for spring! 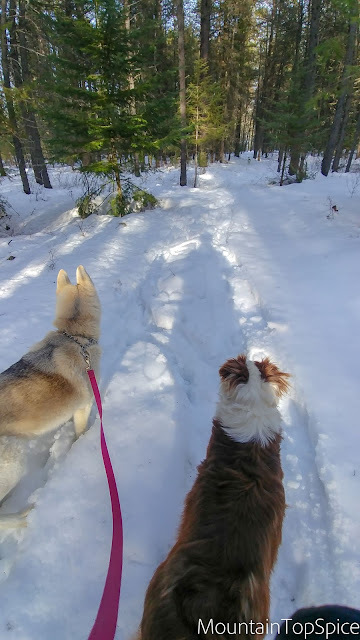 and took the dogs for a snowshoe through our woods. it was so much fun snowshoeing in just a light shirt! It was too warm for a coat! 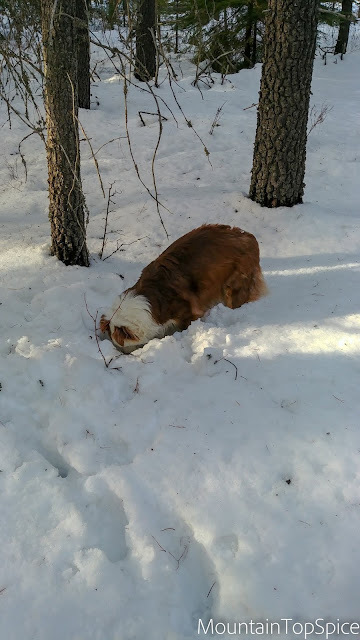 Riley found something interesting in the snow. Annie and Riley... always on alert.... so much to see and investigate in the forest! 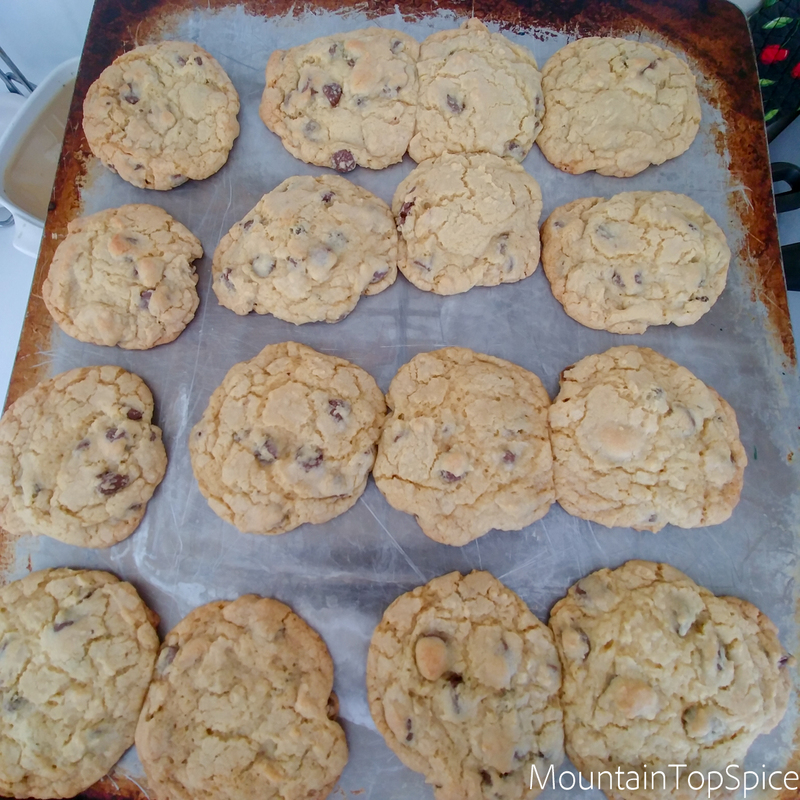 Our favorite chocolate chip recipe... variated now, as I do not use shortening any longer, and only real butter. The trick to perfect chocolate chip cookies is to bake them until they just start to lightly brown, remove them from the oven, and let them cool 2-3 minutes on the pan, and then remove them to cool. Since the middle of March, we have had days on end of sunshine! It has been glorious! You can see the joy on Annie's face... that we are all feeling! No more snow and ice on the roads! The snowbanks remained quite high after the sunshine began, I could hardly see over the tops of them. 60+ degrees and enjoying every drop of that gorgeous sunshine! The March Worm supermoon... it was amazing to see! 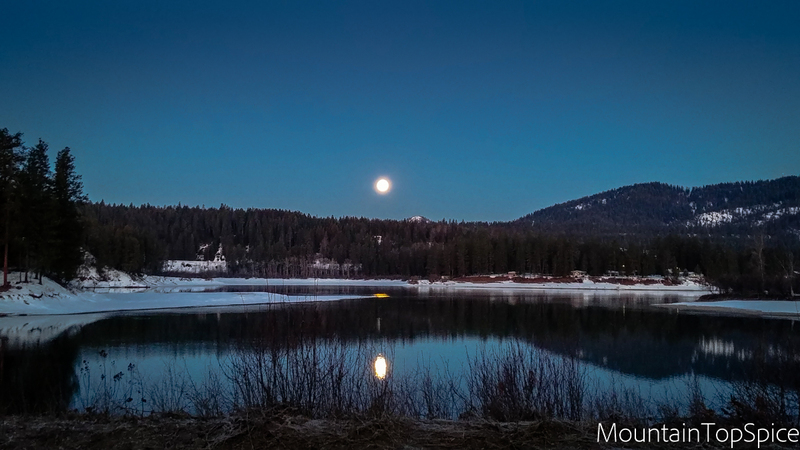 As the moon set over the river, it was a splendid moment to witness. 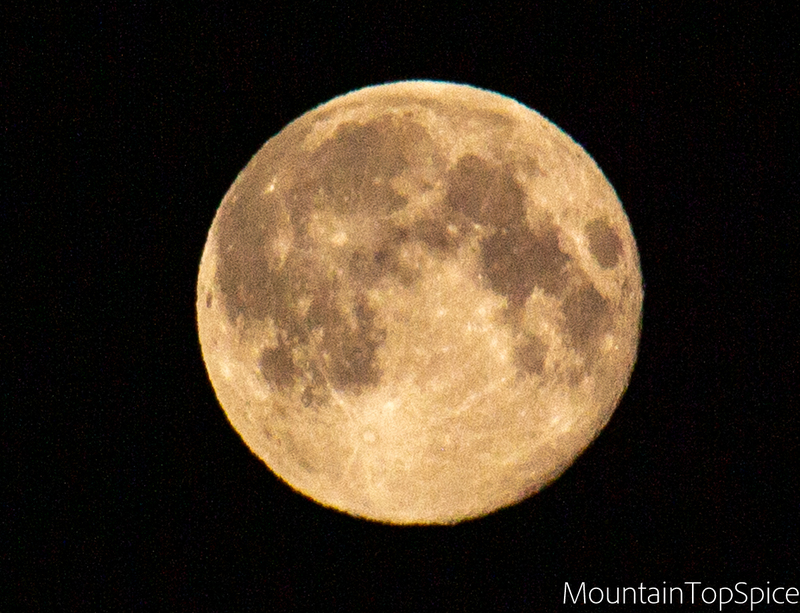 this was the only one that we were able to see without cloud cover. It looked like an orange in the sky! I always start my seeds after St. Patrick's Day. With our late and very short growing season, I start most of my seeds indoors. 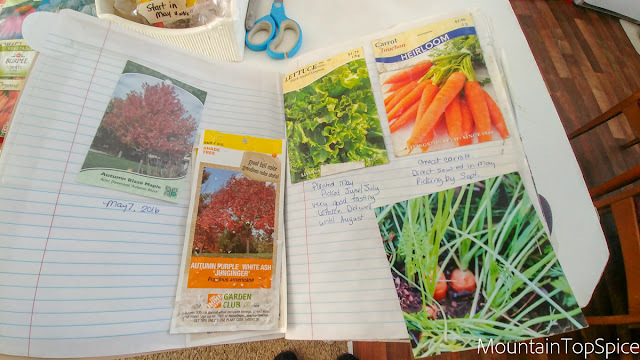 I have used this Garden journal I created back in 2016 to keep a record of my crops each year. 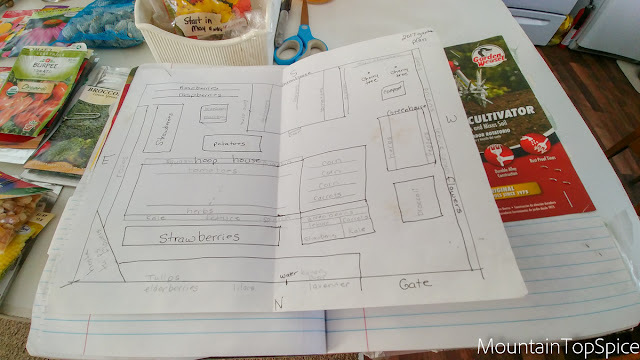 It is a simple composition journal, doesn't have to be fancy, but it works to keep track of your planting schedules and success. These are my favorite flowers to start indoors. Some can be sewn directly into the soil, but others need a head start. Keeping track of each seed packet and bush/shrub/tree that has been planted, along with results/failures. I also have a garden plan, which is pretty basic. 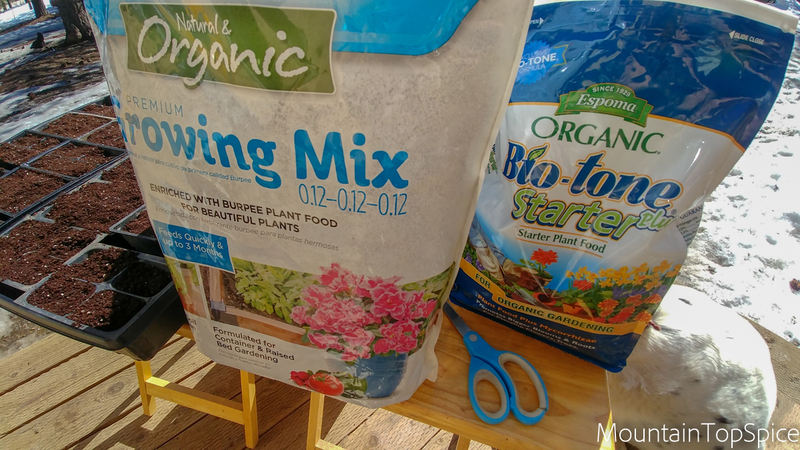 I mix my seedling soil with a bit of this Organic Bio-Tone Starter. I find it gives the plants an extra head start. On a warm sunny day, with plenty of snow still on the ground, I planted the seeds. 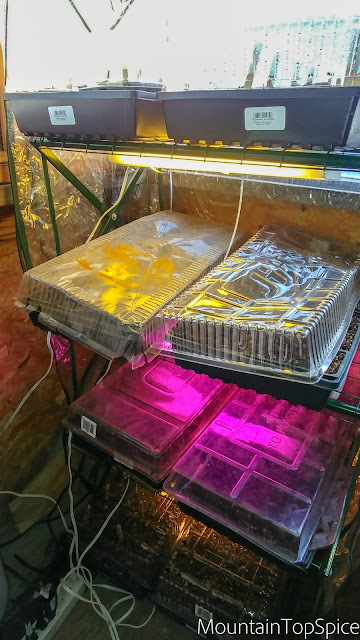 Then I put a seedling warmer on each rack and mounted the grow lights (I just use regular fluorescent lights or LED lights, I don't find the grow lights are any better than the cheap ones). 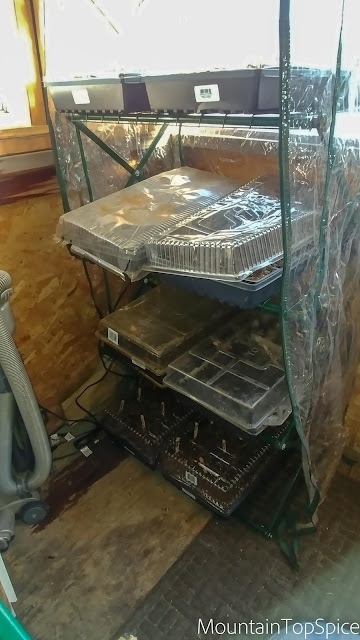 I leave the lights on for 16 hours a day, and off for 8 hours, as plants need to rest as well. 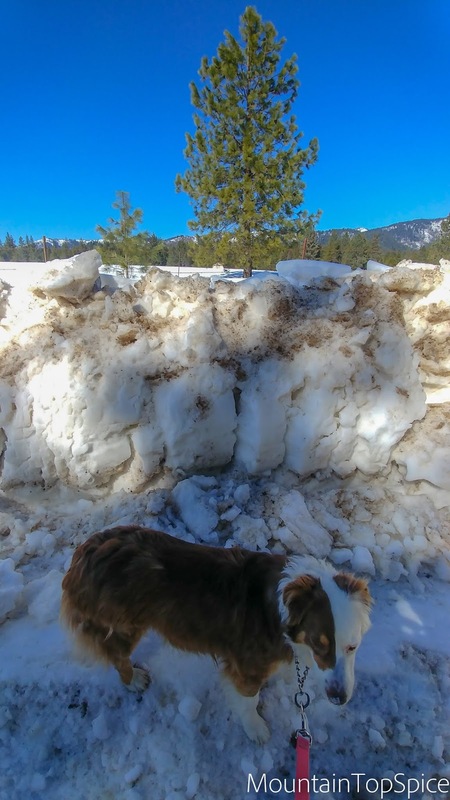 The snow continues to melt! Large puddles and little creeks start appearing in the fields. 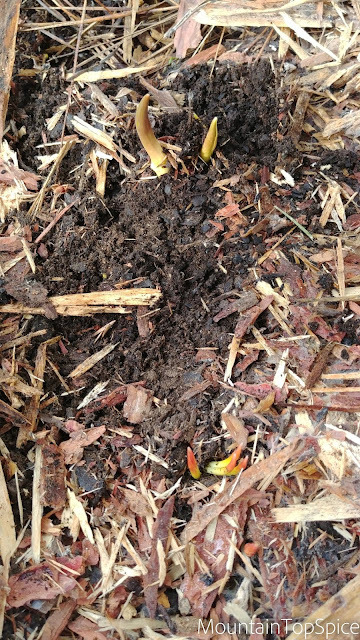 It is an exciting time to see the ground reclaimed back from the snow! 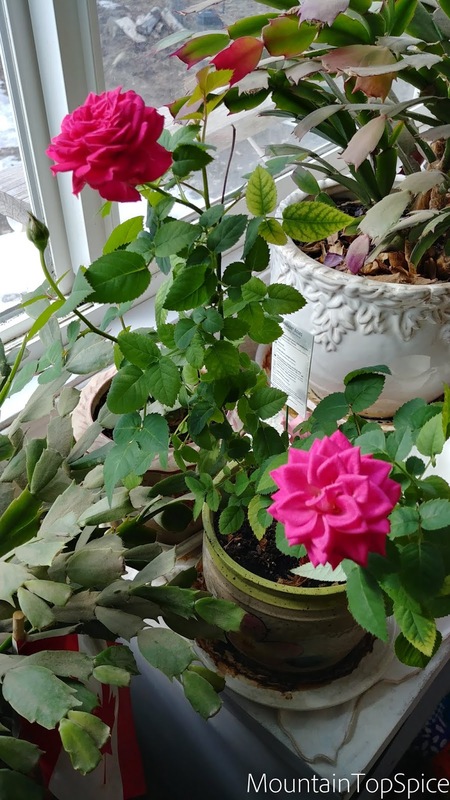 Indoors, my Parade rose continues to outdo itself! For the first time, it now has 3 blooms appearing! This is the rose my husband bought me last year, and it is still blooming away! I'm amazed because any other indoor roses I've had in the past have never lasted that long! I've been giving it a weekly teaspoon or so of coffee grounds. I think this might be the trick, along with the great light it has in this spot. Today March 31... this is still my garden! 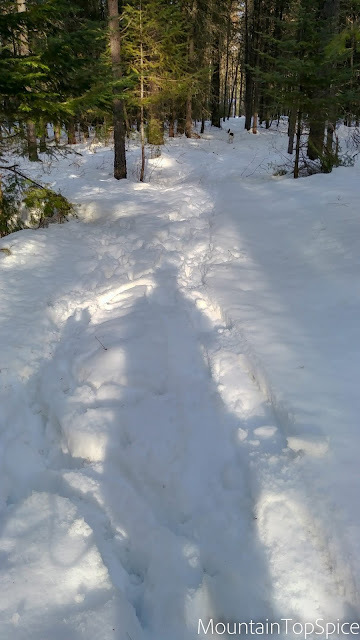 Much of it still lies buried under the snow blanket. and look at what is eagerly popping up through the dirt! I may not have flower blooms in my garden just yet... but I've started putting back out my glass plate flowers and their cheerful faces will light up the garden until the colorful blooms arrive. 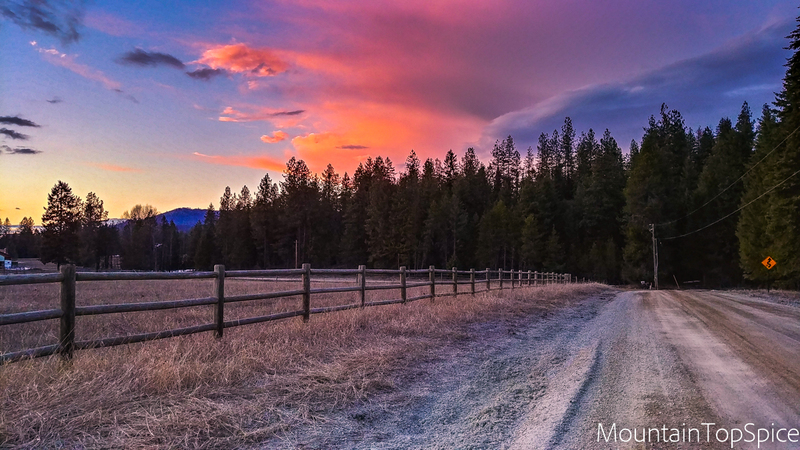 As my husband and I walked the dogs this evening, the brilliant sunset filled the air with its beauty. March... in our world anyway... left us silently as a lamb. How thankful we are for the beauty in our skies... I know many others got unexpected snowstorms this year on the last day of March. One just never knows what a day may hold. So we make the most of it, enjoying the beauty of whatever each day holds for us. Like my father tells me... there is one thing you can't change... and that is the weather. Like it or not, there is not much you can do about it, but just make the best of it. And we are. 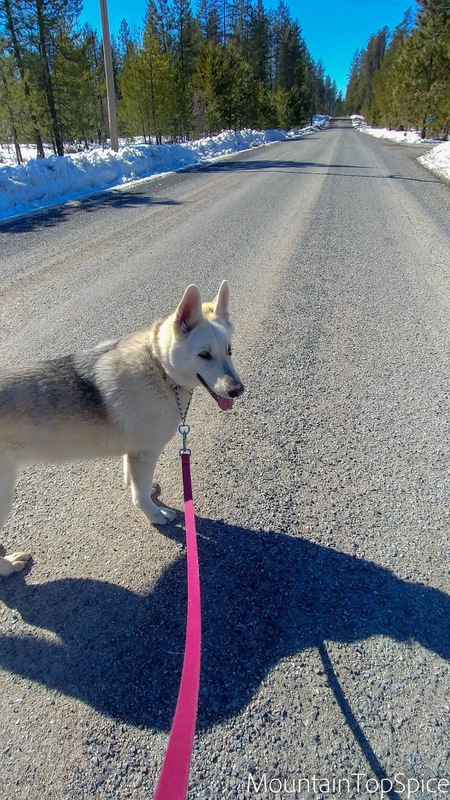 We are loving the gorgeous sunshine as it slowly melts the snow, and we are very thankful that the risk of flooding here is low because of the slow snow melt. March went out like a lamb here in Pennsylvania, too! So thankful! Cooler today, but gorgeously sunny! I just started some flower seeds this weekend! Wow, the first photo with the horses looks like a painting! What a gorgeous photo! If you paint, you should consider painting it! That chicken spaghetti dish looks rather yummy and great comfort food. Yes March is over but we woke up to a dusting of snow. It is warming up though.....loved scrolling through all of your photos! Have a lovely week! Hugs! Oh, such gorgeous photos, Marilyn, as always! Yes, it seems that spring has finally arrived in your corner of the world. Here in Georgia, the daffodils have come and gone, and we are entering the pollen season with a vengeance. And like you, I simply want to enjoy the spring temps and not long for the heat of summer just quite yet. How beautiful, Marilyn. Your world is such a far cry from the crowded suburban, nearly urban, world I inhabit. We do get some gorgeous views and sunsets over the ocean and the bays and I never take them for granted as I pass them each day, but your big skies are outstanding. Here's to a warm and sunny April! Breathtakingly beautiful photos Marilyn. 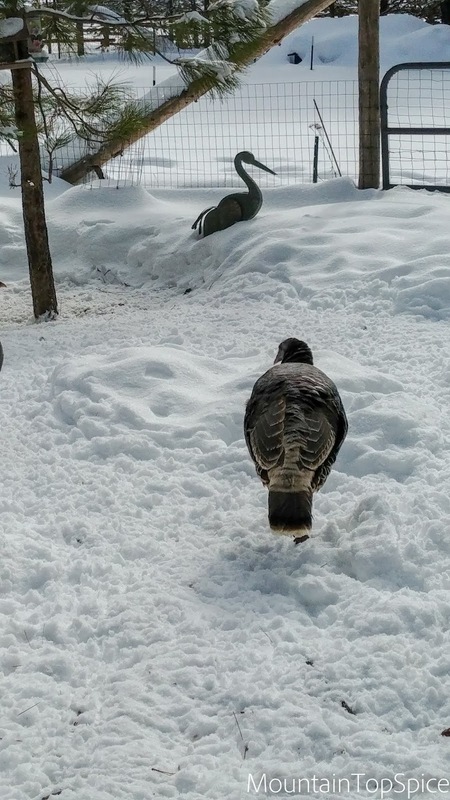 Wonder what bird is that by the turkey. 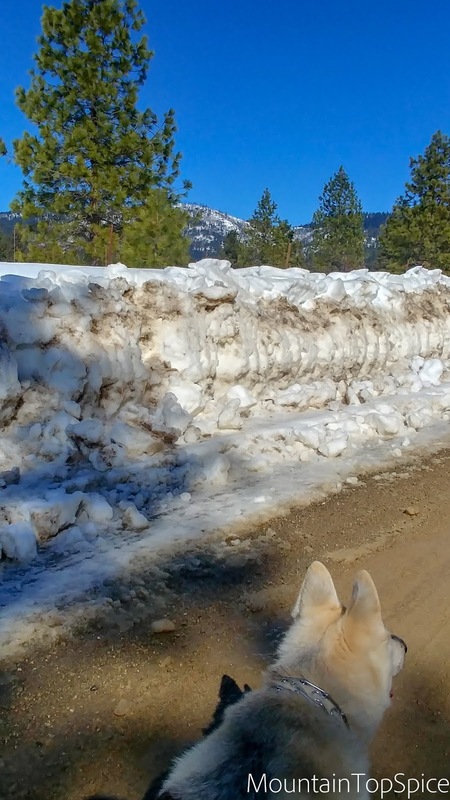 You still have lots of snow and so do we around here. Looks like a great chicken casserole. Have a great week!! Good morning Marilyn. I, for one, am very happy that March went out like a lamb up here in the Northwest. I have enjoyed the sunny days too. 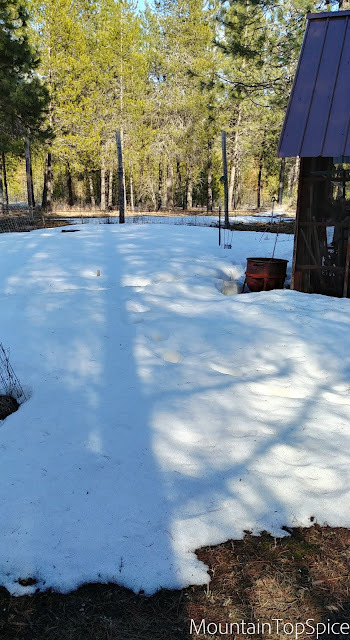 We just have two small patches of snow left in our yard and I think they will probably disappear by the end of this week. Hallelujah! Your dad is surely right. You certainly cannot change the weather so you just need to make the best of it. I need to try to remember that. We love chicken spaghetti. I don’t make it very often since it’s just the two of us now. Your tea time quilt topper is beautiful. Wishing you a lovely Monday. Happy April! Gorgeous photos. The first one is exceptional! Happy spring! 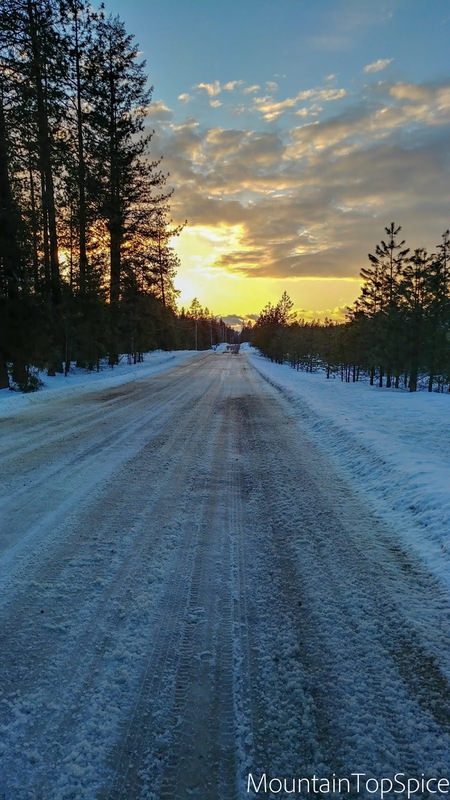 How I enjoyed my blog visit today, your photos are spectacular. Whilst we haven't had snow we have had terrible wind storms causing damage and making it impossible to make a start on outdoor jobs. Your tea quilt looks beautiful too, looking forward to seeing it finished. Love your wonderful glass plants, how beautiful they look. 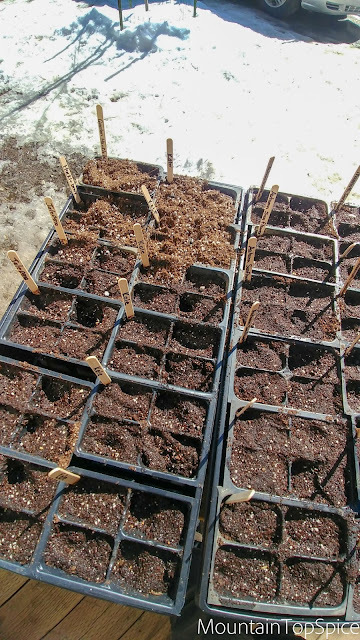 Saturday was a glorious day, I even had some seedlings soaking up the sun outdoors...and then Sunday was awful, blustery and cold and snow! That's spring in the mountains! Well, you are definitely ahead of us here in Manitoba.I enjoy seeing your world and the beauty you are enjoying. 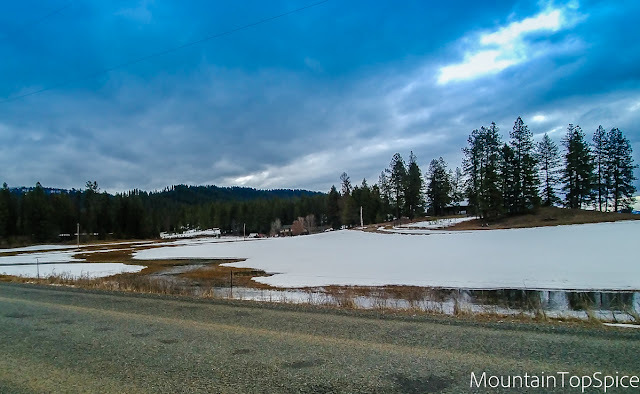 Snow is melting here as well and soon we can expect warmer weather to warm the soil. March went out like a lamb here in B.C. as well. I can only remember one other year when we had such a mild second half of March. 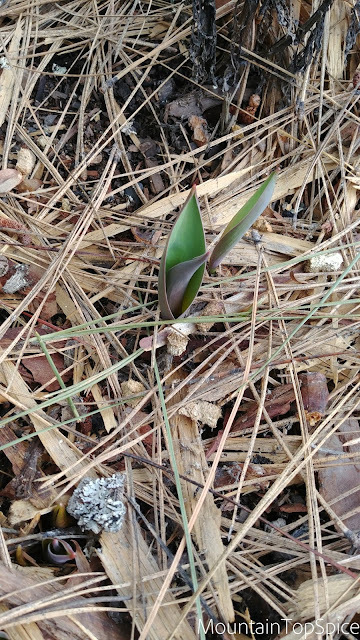 And now we move into April and before we know it blooms will be popping up all over the place. I really enjoyed your sky/cloud photos!! Have a great week. The grandeur and beauty of your world always takes my breath away. So much gorgeousness to be seen on those walks of yours. Love those photos of your long country road walks with the surprise of the glorious skies at the end of the road....AND the moon reflecting on the water...amazing. 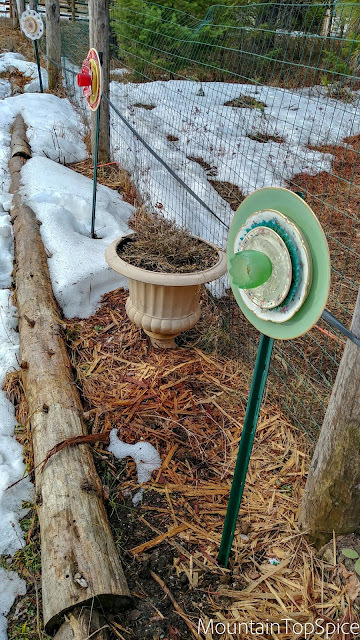 How fabulous the snow is beginning to melt and the earth's springtime bounty is beginning its dance. Happy packets of seeds are always a joy to see. I am always amazed as to what flourishes from an itty bitty seed. Love your pretty paper pieced quilt. You have selected such pretty fabrics. Yes, you must have a garden party with your pretty quilt as the belle of the day. Enjoy your April spring-time days. As ever, you serve up heaping portions of beauty, joy, and real life from your neck of the woods, Marilyn! A visit here is always an absolute treat! We were on a road trip for the last 10 days of March and other than it being a bit cool and rainy, nothing spectacular happened weatherwise. I actually got to see the Daffodils, Forsythia, and Weeping Cherry Tree blooming at our NC farm. That made me happy!!! Have a blessed week! There's such a difference between the first and the thirty-first of March! Your chickens look healthy and happy to escape for awhile. Our spring on Vancouver Island is ahead of yours, but soon you will catch up and race ahead! Oh, so sweet to visit with you tonight, my friend. Though I am happy it is Spring, I always, always feel sad when winter leaves! Fall is my favorite season, but winter is a close second. I just love the stillness of winter. The older I get, the more I love that slow pace! But, the flowers and all of the beauty is so wonderful to behold, too. Just like life's seasons, the seasons of the year each hold their own sense of beauty and wonder. Oh, those cookies look so good! I trust the Lord will bless all of your gardening efforts this Spring! Much love and many blessings to you! Ah so lovely your photos Marilyn, you’ve a real artis eye in you shits, love that the LORD has shown us such beauty in Hus creation for su to enjoy, an dyiur dogs are sooo cute. I’m also amazed at your rose, I don’t drink coffee other wise I’d do that too, even over here. Our if coruse are outside! Sigh typos, in your phots dear sis, or shots, it’s veyr late here, need to bed! 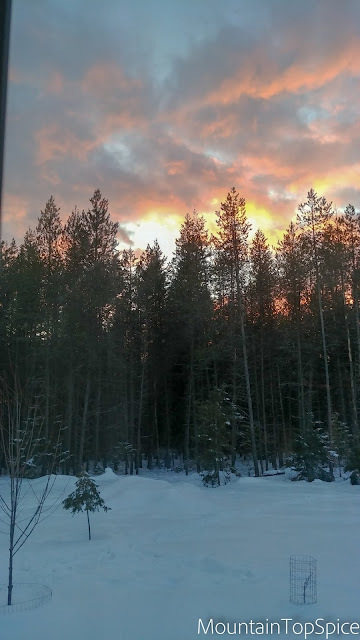 You have the most gorgeous sunsets! Spring is such a wonderful time of the year as we witness everything being revived and awakened after a long winter nap. 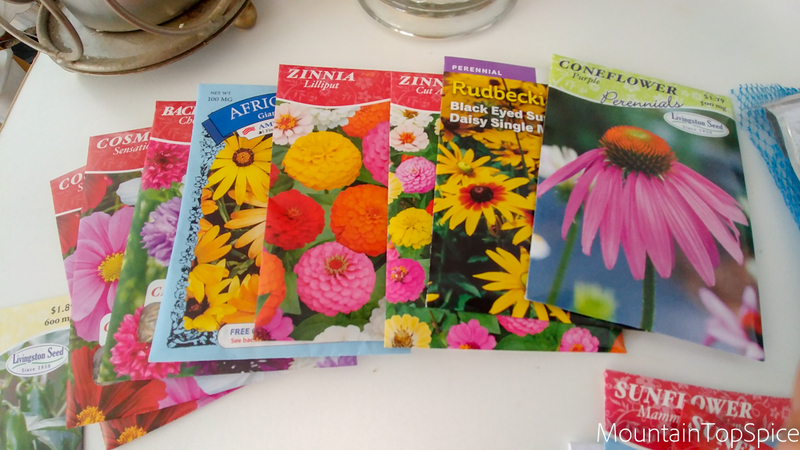 I am impressed with your green thumb...you have a great set-up there with all the seed starts...zinnias are a favorite of mine. Happy Spring to you, dear Marilyn! WOW! Great photos of the moon! Spring is taking its time to arrive. We have snow here this morning and cold. I started my tomatoes yesterday. I started my eggplant and peppers the week before. I am getting excited to play in the dirt. Your pictures are divine...Balm to my soul...What wonderful roses too!A delightful post...Idaho is too far from me,completely different from my world...I enjoyed so much visiting you!Hugs! March is lovely in your area, Marilyn, and it's still snowing! 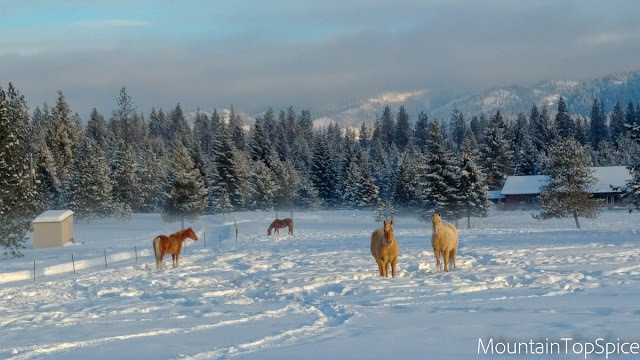 I have a few blog friends who are still having snow as well. Your chicken spaghetti looks delicious, and the chocolate chip cookies look YUMMY. 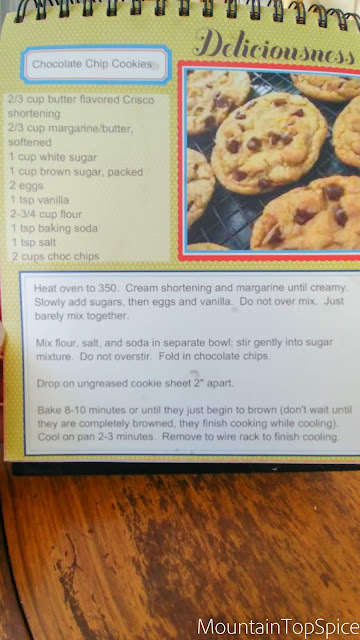 Thanks for the tip on cooling them, cause I often just take them off the pan right away. Your dogs look like they are having the best time in the snow. That moon photo is really nice, and the color of your roses is stunning. I wanted to thank you for your prayers for my son. I appreciate that so much. He is doing much better, and it was comforting to me to see all the comments and thoughts of my blog friends. You know, Marilyn, I always swoon over your gorgeous photography in you piece of heaven. The moon photos, especially over the river, were fabulous.I'm so loving your darling teacup quilt...I look forward to seeing it all finished. Your chicken spaghetti and your cookies are sure making me hungry right now. Isn't that a wonderful sight to behold in having your rose blooming in your home? Happy Springtime to you, my friend! Isn't it so exciting to see the flowers come up and getting ready to start your garden. Loved seeing your chickens all running around and I bet your furbabies are always excited to get out and walk. I so enjoyed all your beautiful sunset pictures and you have beautiful pictures of the super moon too, that is great you finally had a cloudless sky to view it! What a wonderful post saturated with beauty and fun! 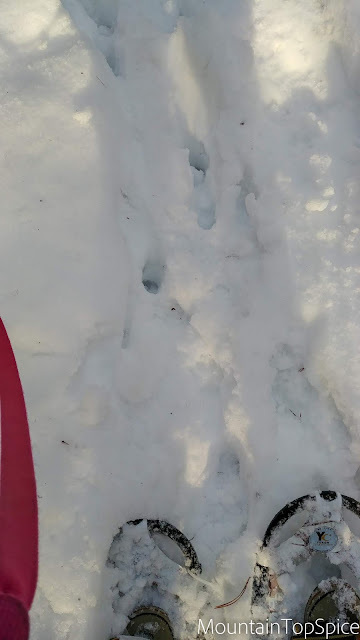 How lovely to go for snow walks! I do love snow and winter...being an Ohio girl in AZ is a challenge at times. I am very thankful to live at the foot of a mountain though. Your chicken spaghetti sounds and looks delicious. Would you ever share the recipe? Thank you for visiting my blog... and for your sweet comment. 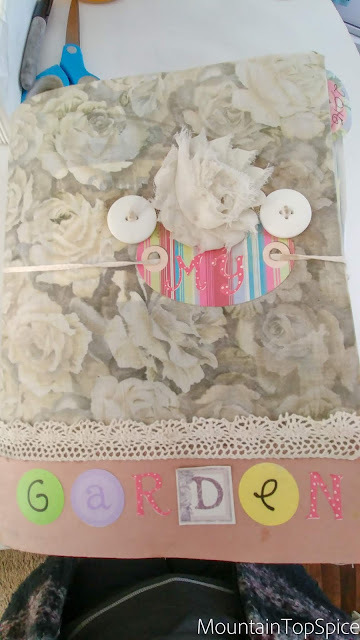 I would love to see your cards when you make them. Have a wonderful weekend and I'm so glad that spring has arrived for you! True words from your father. It's good to go with the flow of seasons that we haven't created or that we can never control. You had some beautiful sights to see in March. I'm chuckling not clucking about your chickens fleeing the coop! 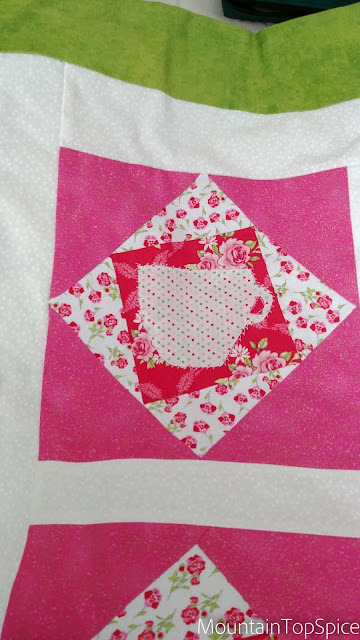 Love your tea time quilt! Hope you have a very good April weekend! beautiful series of photos...love them. March went out like a lamb here in our part of Colorado, as we has beautiful warm sunny weather, but now a possible blizzard is predicted for tomorrow, so the weather is still very changeable. We did a lot of yard work, seeding and fertilizing, as the snow we get melt will be helpful when it melts. I love the chicken spaghetti and cookies you made--they look very delicious! I'm also looking forward to planting in late spring---I've started my herbs in my garage. We had some gorgeous spring days last week but this week we've had much cooler weather and SOOO windy. It is supposed to warm back up next week. We have a small greenhouse so a lot of plants and flowers are ready to put outside as soon as we know a possible freeze is no longer a threat. Such beautiful photographs you've shared here.